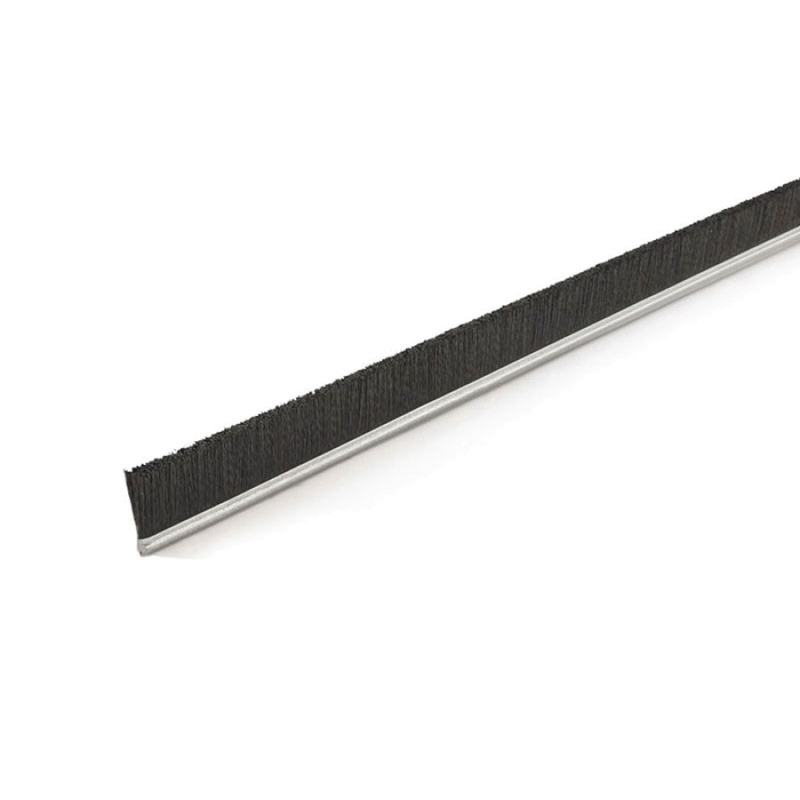 Strip brushes, often called metal channel back brushes, are versatile and durable. These brushes consist of natural, synthetic or metal fills held securely in place by a U-shaped metal channel and center wire. Strip brushes are manufactured straight (72" length), and can be transformed into other shapes such as disks, ovals, cups or cylinders. Strip brushes can be customized to fit an enormous amount of applications, including but not limited to: sealing, conveyor cleaning, surface cleaning, surface roughening, dusting, product separation or transfer, tensioning devices, static dissipation, external or internal pipe cleaning, filter or screen cleaning, glass washing or fruit or vegetable washing. The size of the strip brush is determined by channel size (the metal back), and the fill material and brush configuration (such as straight, coiled, wound or cup-like). Trim lengths are virtually unlimited; channel sizes range by number: the smaller the number the smaller the base width; fill material depends on what your application requires. Almost all fills are available, including conductive, static dissipative, in a range of diameter sizes. There are many choices of brush fillings and virtually an infinite number of brush specifications within each metal channel size. For this reason, we ask that you complete the Strip Brush Design Form > if you need a custom size or shape. This will let us know what your individual requirements are so that we can make a brush to fit your needs. This includes the proper fill material, and allows for the length, trim and overall design to fit your application. For any other specific brushes you may need, further scan this Web site or call us at 1-800-950-7950 or 1-323-724-7777. Gordon Brush will get back to you within 24 hours with a quotation. 0.004" 0.006" 0.008" 0.010" 0.012" 0.014 0.014" 0.020" 0.030" 0.045" 0.050"
0.5" 0.63" 0.687" 0.75" 0.88" 0.906" 0.937" 1" 1.13" 1.187" 1.25" 1.5" 1.63" 1.687" 1.937" 2" 2.13" 2.187" 2.687" 3" 3.187" 4" 5" 6"
Size 2.5 ; 1/8" x 1/8"
Size 10 ; 7/16" x 7/16"